Women - Free entry at any time. Men - Friday-Saturday 100 CZK-300 CZK; Wednesday-Thursday free. One Club Prague is a lively cocktail bar and club in the Old Town, located between Wenceslas Square and the Old Town Square. The entrance level bar is open all day, serving a range of cocktails, beers, spirits, wines and sparkling wines. The décor is a mix of wood, brick and colourful lights, which, combined with the upbeat tunes, creates a good 'Saturday night' ambience all week long. But the real action at One Club Prague is downstairs, where it opens up into a spacious nightclub. In the club, International DJs such as AFROJACK pump out a wide selection of commercial house from 10pm all the way through to 5am. The lighting in the club is varied and well designed, especially when the LED show is switched on. On the dance floor, 'hot dancers' keep the party going. And it can get busy, especially later on. If you need to relax, One Club Prague has table booths, and bottle service is available. 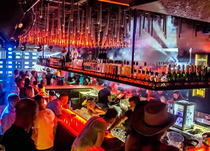 One Club Prague is situated on the tourist route between Prague's two main squares, so it naturally draws an international crowd, but local Czechs also drop in for drink and a dance. It's a smart venue to soak up some of the Prague buzz.